Before I go into details about this race, let me remind you – that 4 years ago I did a marathon in Bremen – but had not trained properly, barely finished it (just below 5h) and was so exhausted I slept for 2 days in a hotel afterwards. And did not run at all for at least 6 months after so much suffering. So when I started training for Ironman 70.3 – I was aware it will be much harder than a marathon, and I need to be serious about preparing. This time I trained for 10 months, sometimes up to 10 times per week (3 run, 3 bike, 3 swim, 1 strength) and did a bike training camp in Mallorca in April. My goal was to beat the average finish time – for an average Ironman 70.3 race it is about 6 hours, but the average time for Mallorca race in 2013 was 5h39min according to RunTri analysis. Taking into account that the weather can get very hot and bike route is not an easy one with a 850m climb, my guess is that competition in Mallorca is tougher than in other races. Since last July I’ve been training for an Ironman 70.3 – which includes 1.9km swim, 90km on bike and 21km run. About 6 months ago I applied to Ironman 70.3 Mallorca, but had no experience with a road bicycle at that point. In November I received my Canyon Ultimate CF SL 8.0, but as it was already too cold outside, I trained only indoors, and my longest training till April was 65km. 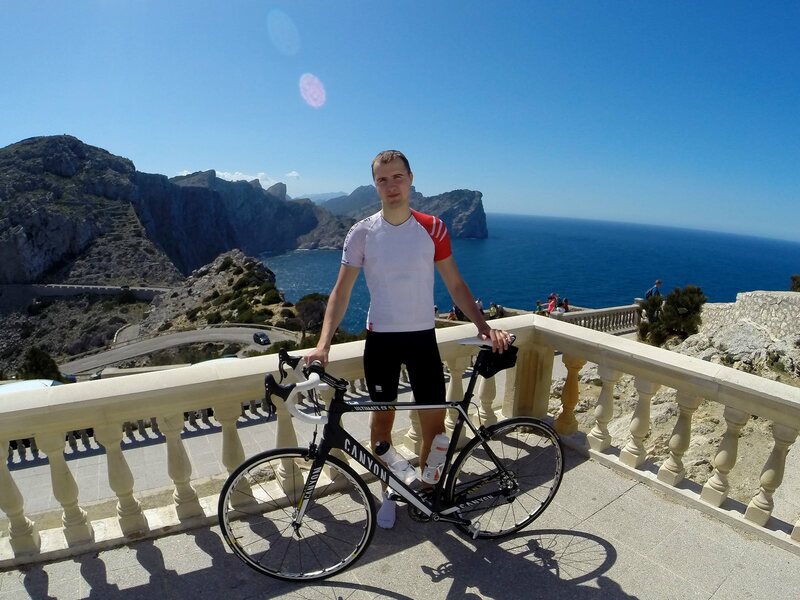 So I was very excited to take part in VeloLove.lv training camp to test out the bike on a real road and do some training in Mallorca before the competition to get some feeling, what is it like to do a 90km bike route with a 850m climb. The short answer – not easy!